Here you go folks! 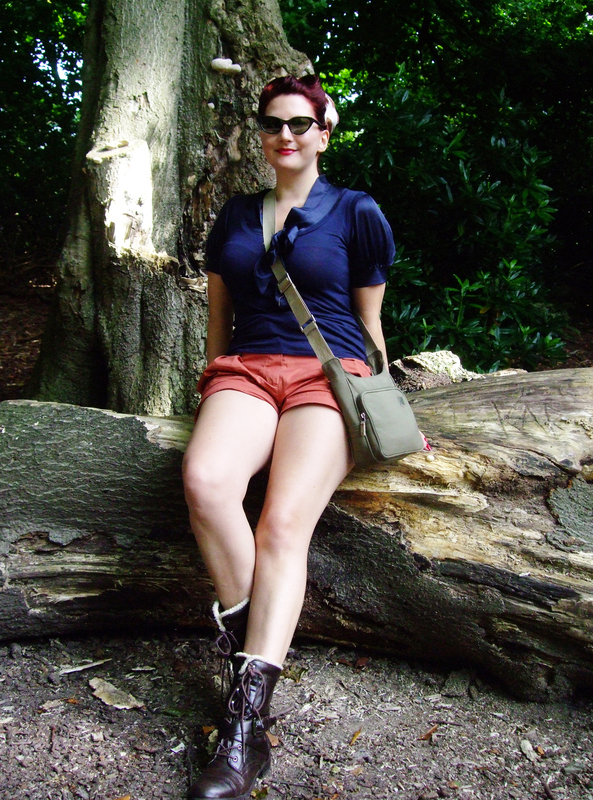 A round up of photos taken mainly by Mr. Mew of the 3 days. I would have included more of him, but he was not happy with his outfit and hat mismatch, so have had to leave some out. Enjoy! The camels outside the Driver’s Club VIP area! 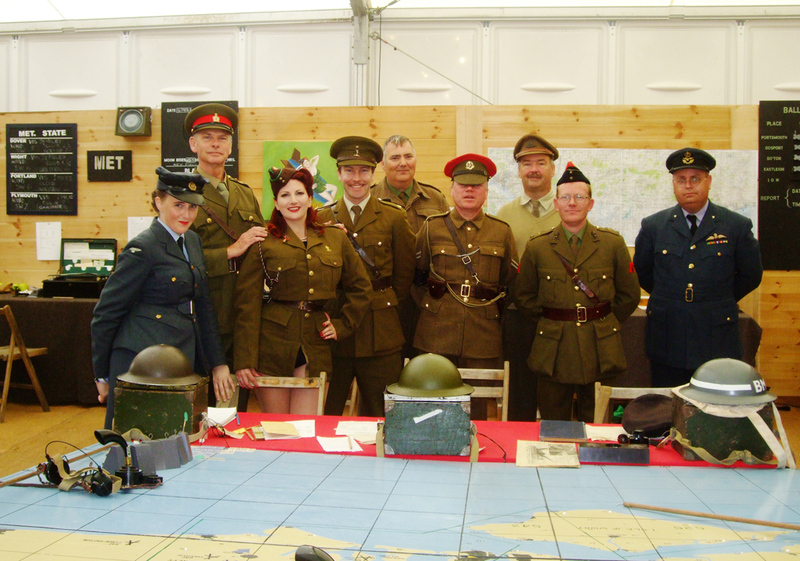 Kitten and The Garrison reenactment Group with a couple of members from the Goodwood team too! Dan Gurney and Kitten in the Driver’s Club. What a guy! 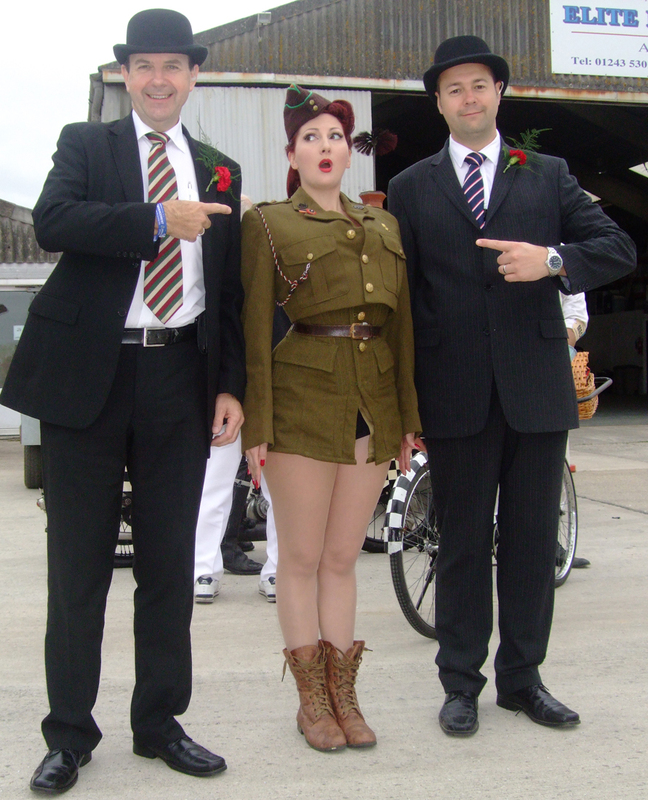 A couple of pinups from a magazine wanting photos! Derek Bell, Kitten von Mew and Tiff Needell in the Driver’s Club. Nice to be recognised! 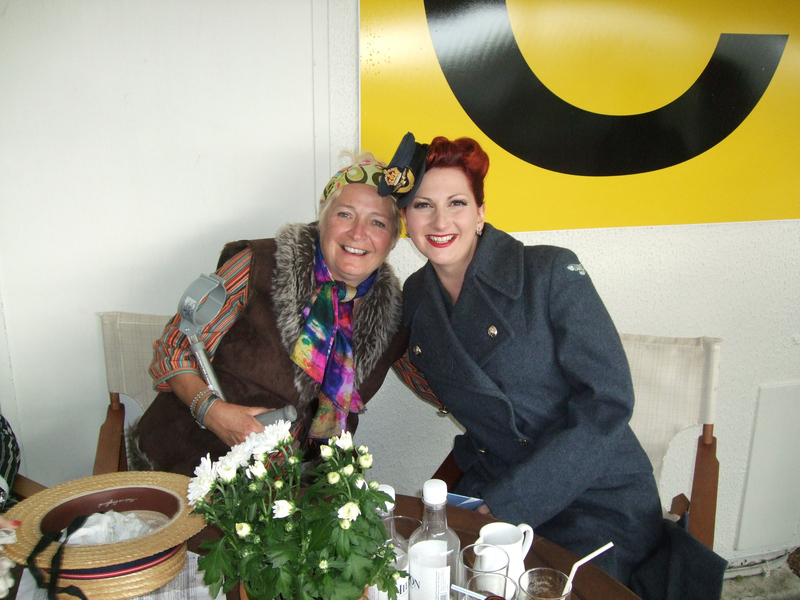 Kitten von Mew and Sue O Donoghue in the backlot having a squidge. Didn’t get to see enough of my lovely lady this year! Terry Elliot and I posing with the Daily Telegraph on Staurday which had a 2010 photo of me in there advertising Goodwood! Yeeehaw! 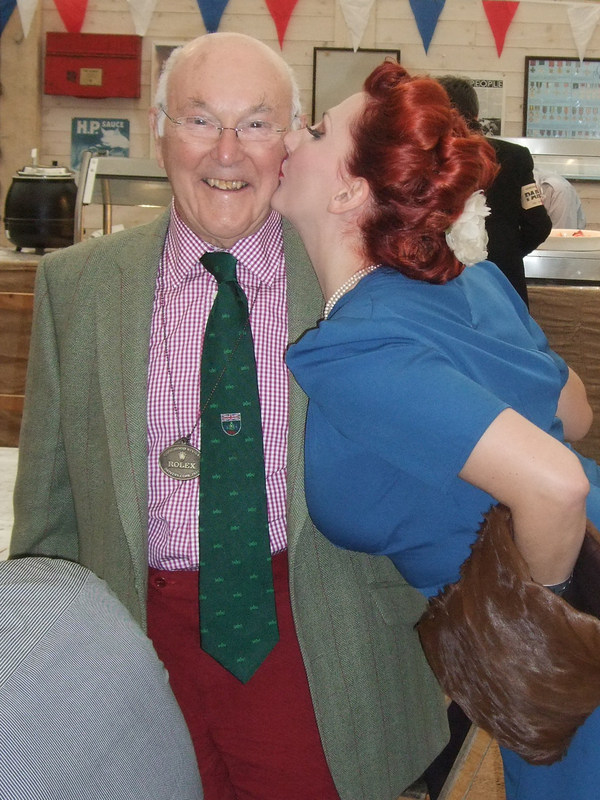 Mid shoot on the Swordfish, posing with British Navy veterans, whilst wearing the gorgeous Union Jack WKD corset! 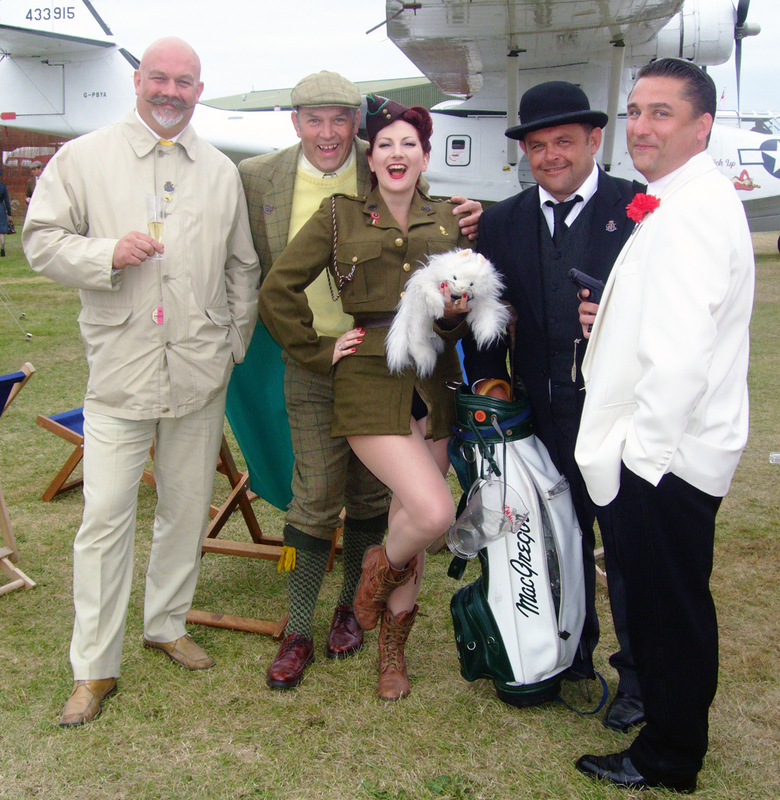 The best of British at Goodwood Revival 2012! Posted in Events and Performances and tagged 1940s pinup, army pinup, corset pinup, derek bell, goodwood 2012, goodwood revival, kitten von mew, lord march, military pinup, pinup girl, racing cars, stirling moss, union jack corset, vintage pinup, what katie did corset, what katie did pinup, WWII pinup girl, WWII plane. Bookmark the permalink. Passing confused teenagers with maps “Looking for Air” and puffed out parties of girls thinking that it would be quicker than the cable car, no one really took in these beautiful surroundings and were more hell bent on finding the next death defying ride. If only they were to stop for a breath! Look at the stunning lake with its oriental pagoda! 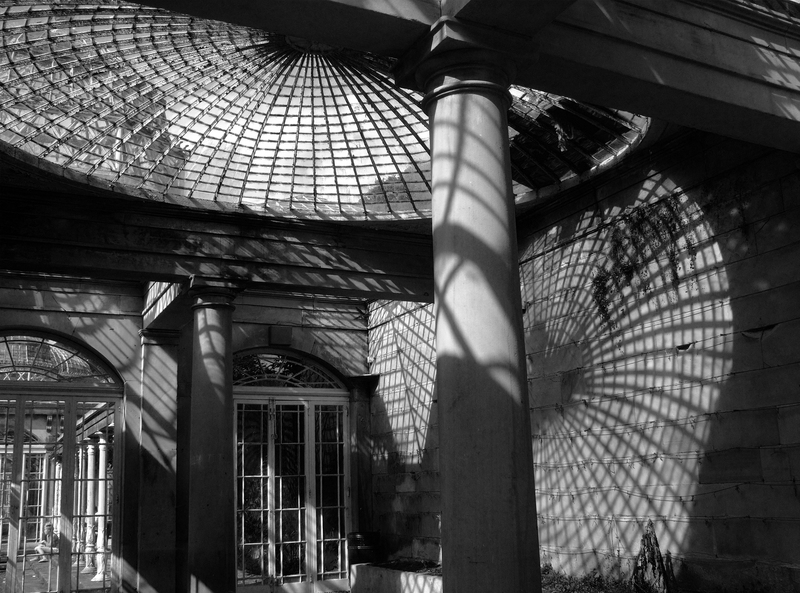 Take in the shadows and stillness of the once tropically cultivated conservatories! Imagine the harpist that lived in the little thatched cottage and was hired to fill these gardens with music! But no, they just hitched up their low cut jeans over their crystal embellished g-string and muffin tops and sauntered on towards the shouts and smell of fast food. 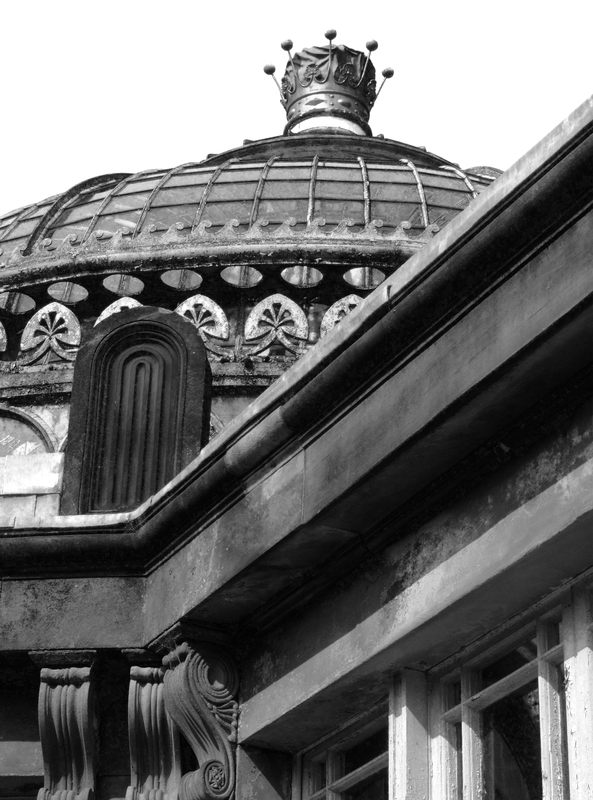 I was in awe of the conservatories. 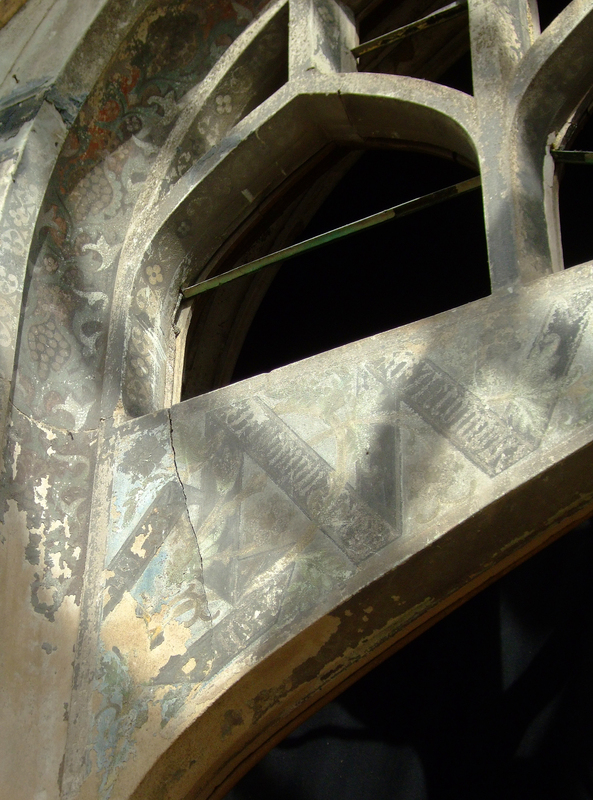 The paintwork had baked in the Sun and cracked to show all of its original colours underneath. 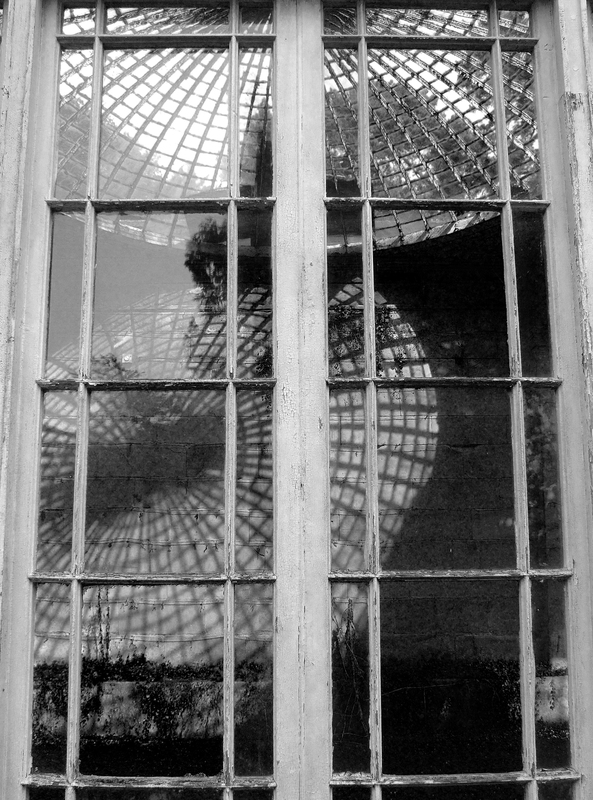 A solitary palm tree, planted in one of the beds had grown large and broken through one of the glass roofs to escape the loneliness within and a large stone pool once filled with fish and a splashing fountain now lay empty and full of creeping weeds and broken glass. From the grounds to the house itself, which is now a shell and houses the Hex ride; There is little of the interior that you will get to see unfortunately. There do seem to be renovations going on, but no word on if this will be historical, a posh restaurant or just another ride. 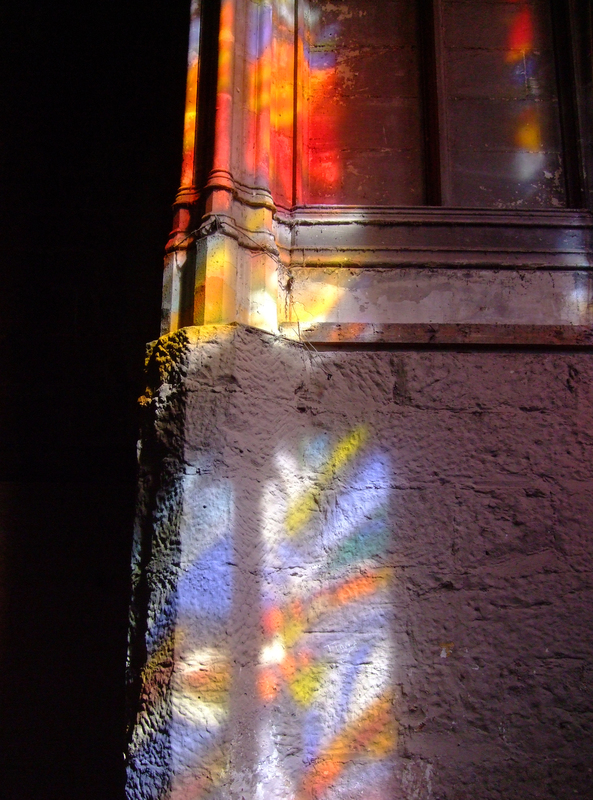 The chapel, with its beautiful hand painted ceiling and stained glass windows is accessible! Unfortunately the ornate alter and paneling was sold many years ago, but a small example of this is framed on the wall with a new reproduction next to it). At first it just feels like an empty room, but you soon find yourself immersed in the ceiling, the restored angels and old side windows with their intricate detailing. When exiting the chapel, a conservatory walkway is visible and also serves as part of an exit for the Hex ride. 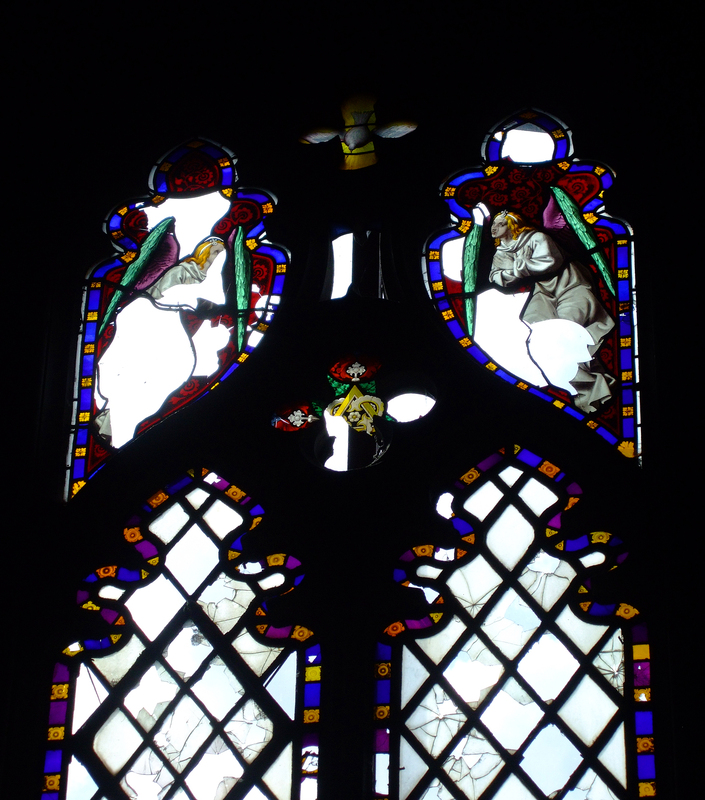 This is currently being restored and some of the original beauty is still visible! It was not hard to visualise what this place had been like in it’s heyday. So full of music, laughter and entertaining! But I guess that is what it is now, just in a different way. 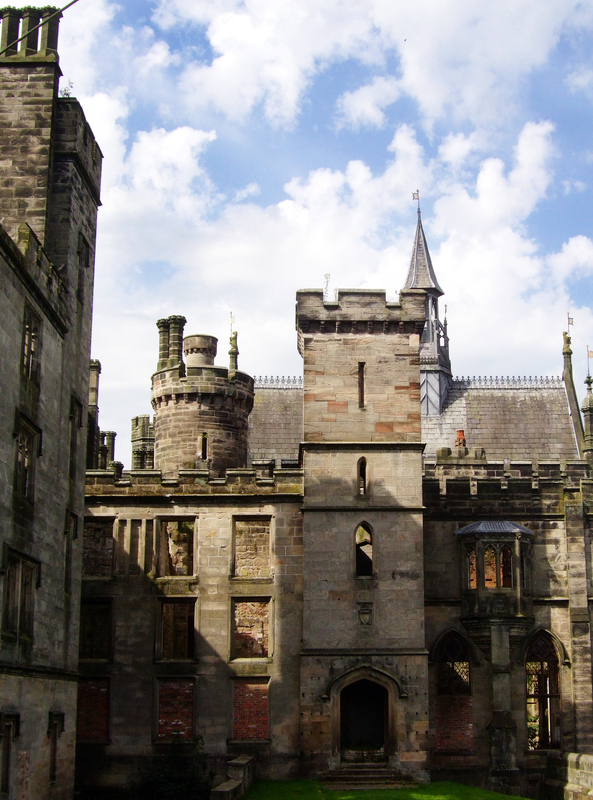 It was thanks to the 16th Earl of Shrewsbury that Alton Towers became such an amazing Gothic mansion. Hiring the famous architect Pugin in 1837 to add extra rooms for the ever growing family and art collection, Alton Abbey was transformed into Alton House. 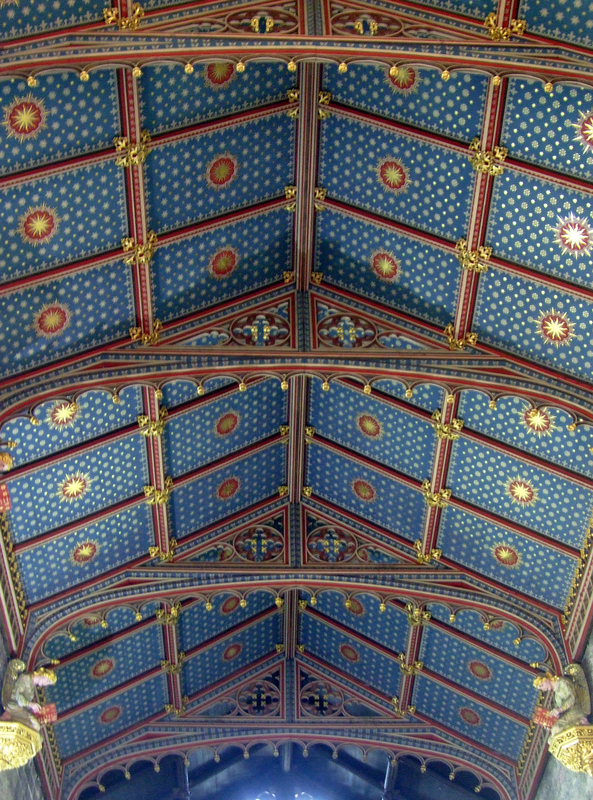 His budget was luckily not on the small side, so lavish vaulted ceilings, amazing carvings, light fixtures and fresco’s were a few of the additions brought to the home until the untimely death of Pugin in 1852 and then the Earl’s unfortunate passing from Malaria a few months later. Unfortunately the 16th Earl’s cousin Bertram, aged 19 years, inherited the estates and title but died within 4 years, although in that time built Shrewsbury Cathedral with Pugin’s eldest son William and finished the work at Alton Towers. After the 17th Earl’s death there ensued a bitter fight for the title and grounds as he was last in line of the Talbot heirs. He had arranged in his will that the deeds were left in Catholic hands with the Dukes of Hazard Norfolk, but this was unfortunately over-ruled and Henry Chetwynd-Talbot took over the great estate. Unluckily for him, this did not include the contents and his celebration meal took place in a rather empty building. In 1857 the executors of the estate had sold off most of the contents in over 4000 lots at auction. Due to the legal action, the 18th Earl’s finances weren’t exactly flush and he could not replenish the lost beauty up to scratch. There was a miss-match of furniture and only basic maintenance upheld. Henry’s main home Ingestre Hall still remained his main abode other than when it suffered a large fire in the 1880’s. 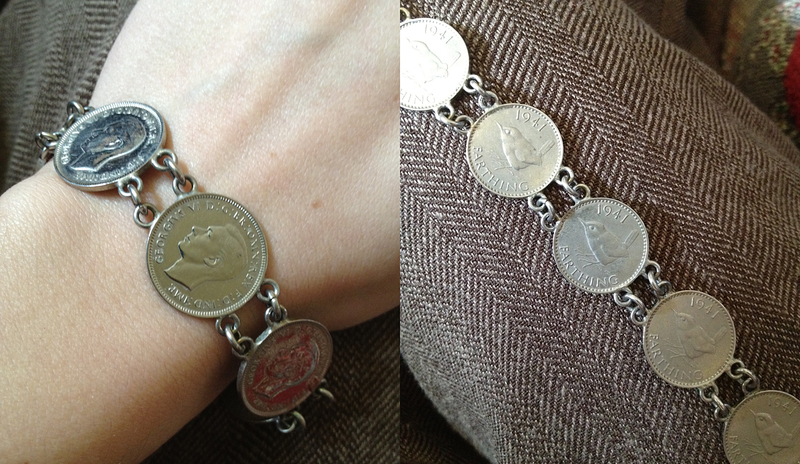 It was in the 1890’s that the 20th Earl Charles Henry John Chetwynd-Talbot (are you keeping up?!) decided to open up the lavish gardens as a tourist attraction. 1000’s of people would attend these open garden events which would include circus acts and fete stalls! In 1896 the Earl divorced his wife and left the impoverished ex in Alton Towers, with no money to maintain the building. Most the estate was sold off in 1918 with the house being sold in 1924. This included a mass auction of the rest of the contents. The house was never to be lived in again. It was finally passed onto the Talbot family again and the main dining room was transformed into a tearoom for garden guests in the 20’s and 30’s. During WWII the house was used by the Cadets and they looked after the house very well considering! The house seemed in good stead until 1952 when the owners decided to blame the armies occupants for all manner of excuses to strip out the remainder of anything valuable. From roofing to floorboards, local residents watched van loads drive out of Alton for weeks. The rest was then set alight in a big pile at the Eastern end of the big house, leaving but a shell. 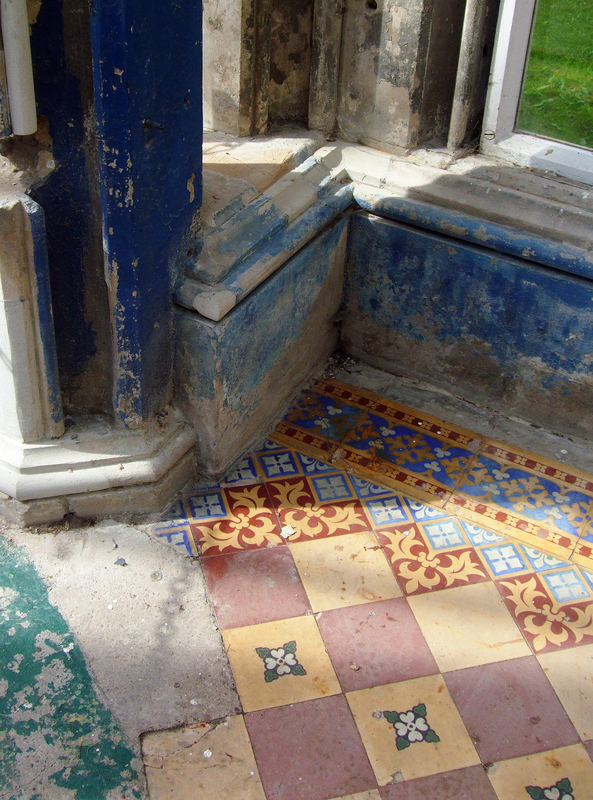 In the 1970’s some of the floors were re-instated to provide some menial structural support. 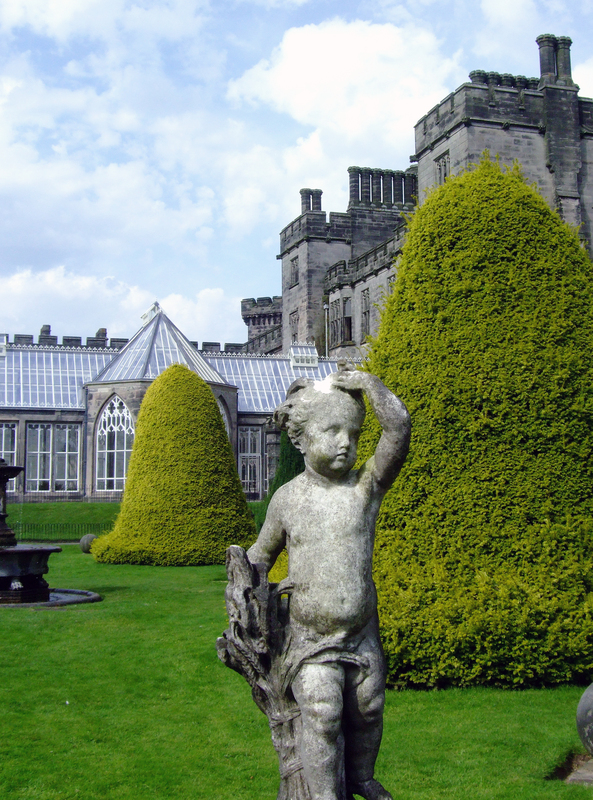 I have heard many stories, myths and legends about Alton Towers including the original gardens being created in dedication the the Earl’s deceased wife, so that he may be closer to her in heaven, but I do not know which Earl this was or if it is even true! One thing that is true though, is the tale of the chained oak tree that you may see snippets of in the Hex ride. There is indeed a chained oak between the gates and Alton village. The 15th Earl demanded every branch of the tree to be secured after running into an old beggar woman who cursed him for not giving her a coin. He dismissed her at first as she shouted “For every branch on the Old Oak Tree here that falls, a member of the Earl’s family will die.” , but a violent storm ensued that night and a branch fell off of the tree and a member of the family died. Whether or not this is all true, the tree and it’s chains remain. Posted in Day to Day, Uncategorized and tagged alton abbey, alton house, alton towers, alton towers chained oak tree, alton towers chapel, alton towers history, alton towers photos, alton towers restoration, earl of shrewsbury, kitten von mew. Bookmark the permalink. This week a rather exciting parcel arrived on my doorstep from Octopus Publishing! 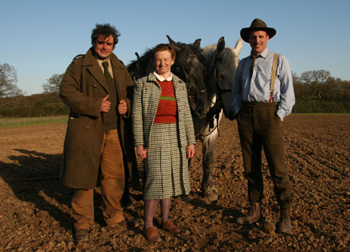 If anyone was a fan of The Edwardian Farm series on the BBC, they will know that the latest is Wartime Farm, taking you through pre and wartime farming life. 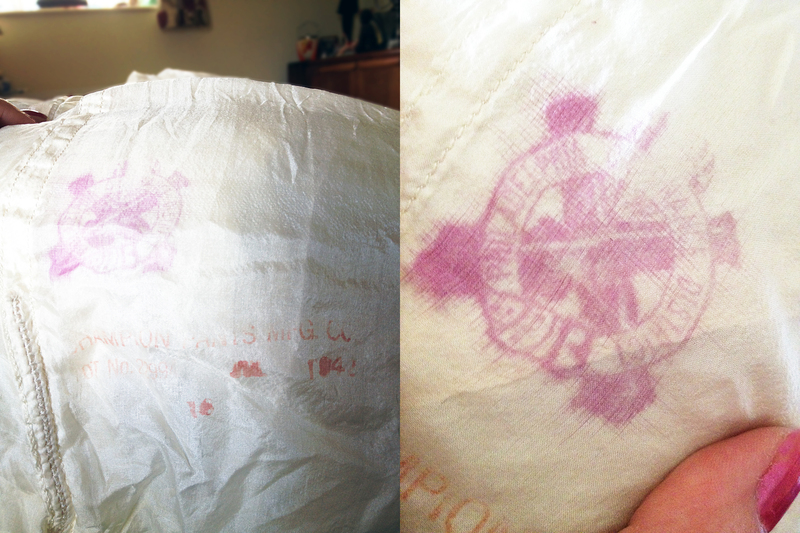 This wonderful parcel was the book to accompany the series. 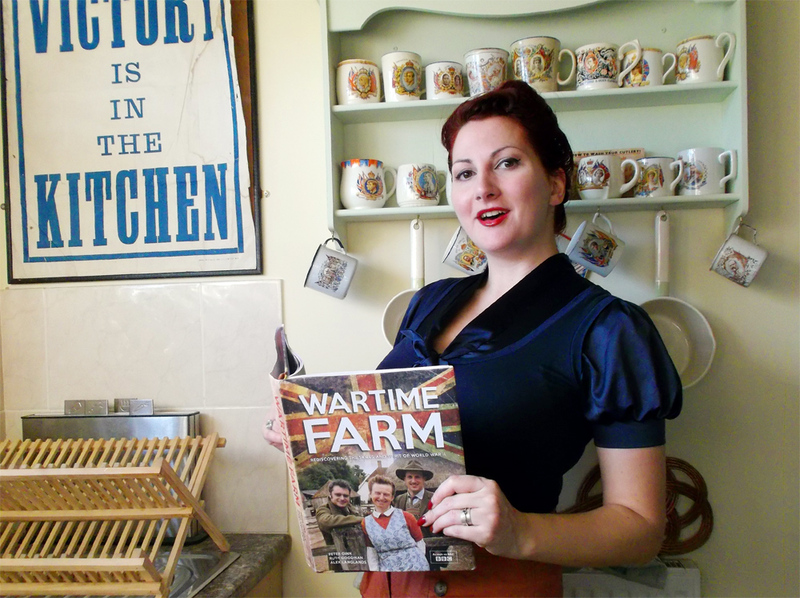 Beautifully presented with lots of interesting photos, fact and recipes, the reader can learn all about farming in the war, the machinery and techniques, the Women’s Land Army and my favourite part…wartime recipes for food and Soapwort shampoo! There is a splendid section dedicated to country fashion, hairstyling (with instructions for Victory Rolls) and entertainment (You can learn the basic foxtrot with the footstep diagram!) and even about the wartime evacuees that descended on the countryside. It always shocked me how much food was rationed in WWII, but to see it in pictures really does bring it home when you see the size of a piece of cheese or lard that had to last your family a week. There is a chapter on preserving and drying meat and fruit with some fantastic and at other times baffling recipes with step by step instructions. I will definitely be trying the elderflower cordial recipe and possibly the Baked Potato Pudding (A pastry base with raspberry jam, topped off with mashed suede and potato which is baked in the oven). Im not too sure about the mock marmalade which uses crab apples, but the Soapwort shampoo certainly sounds interesting and Ruth Goodman said it was the best she had ever used and was now converted to it! If you are looking for Christmas gifts or perhaps an interesting coffee table book for fans of the TV series, you can get this stunning hardback book from the publishers, Amazon or other book retailers. 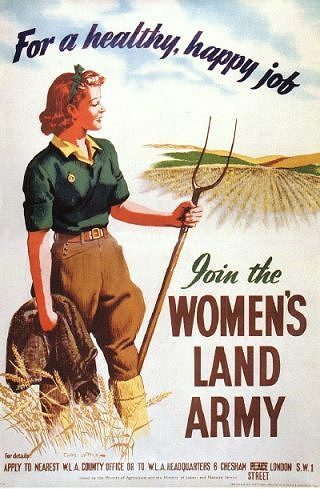 Posted in Fashion and Shopping and tagged 1940's books, 1940's recipes, BBC Wartiem Farm, farm books, farm tv series, kitten von mew, kitty von mew, land girls, octopus publishing, ruth goodman, the wartime farm, vintage gifts, vintage girl, vintage pinup, wartime books, wartime farm, wartime farm books, wartime farm series, wartime fashion, wartime recipes, womens land army, WW2 books, WW2 farm, ww2 gifts, WW2 recipes, WWII books, WWII farm, wwii gifts, WWII recipes. Bookmark the permalink. With only 9 days left until the glory of Goodwood Revival yet again zooms it’s way around the track, I thought I would tell you some exciting developments for this year’s show! 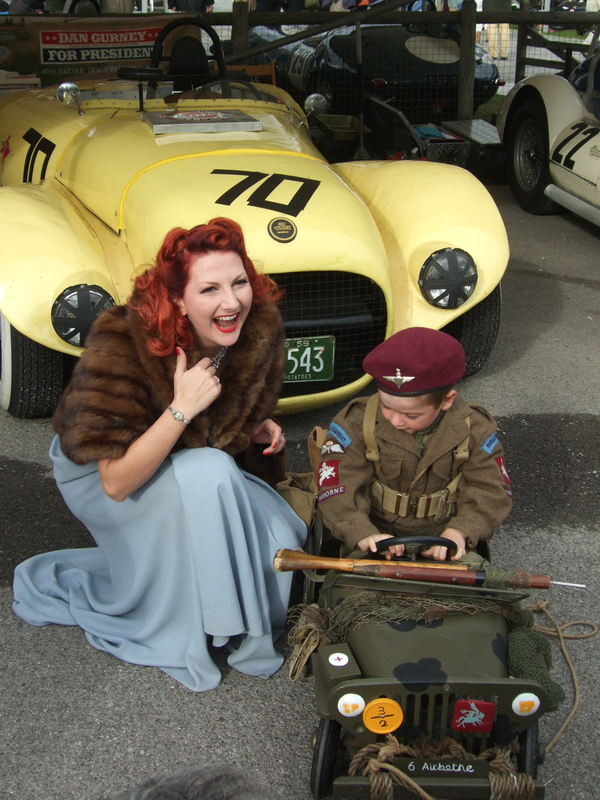 Revival is far from just classic car racing Catnips, it is a full day of entertainment, vintage and vintage inspired stalls, aircraft displays, famous racing car displays and more! 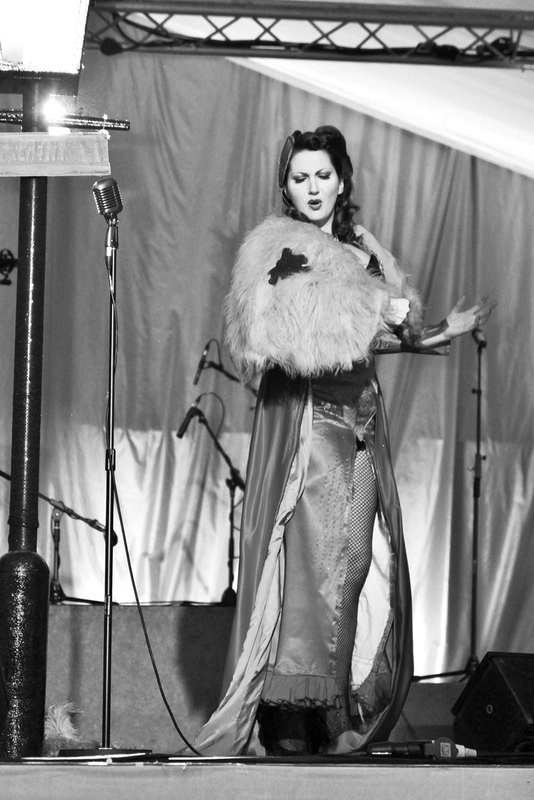 This year is especially exciting for me as they are featuring a new entertainments section called Over The Road, which is more early 1940’s inspired than the 1948-1966 areas that are usually on offer! 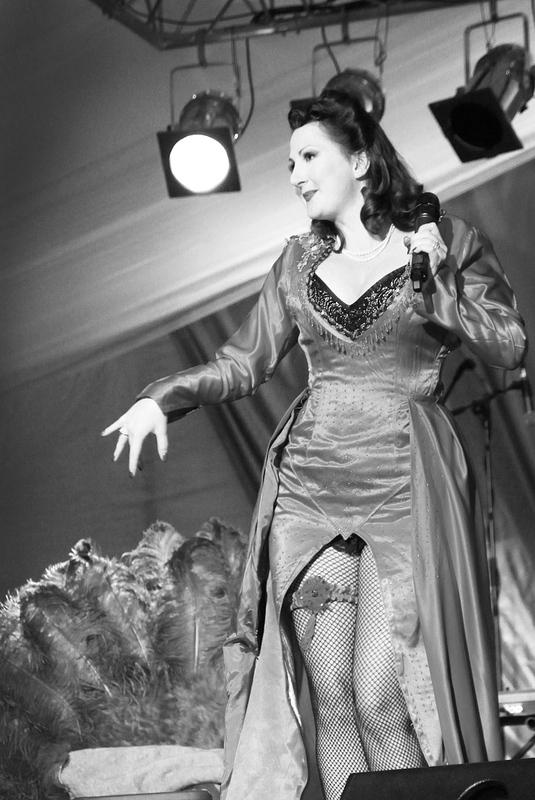 Here you will find the famous Chap Olympiad (Ok, so they are more 20’s/30’s, but they are also a complete hoot and worth watching!) and Mr. B the Gentleman Rhymer who wraps in a King’s English accent over hip hop soundtracks and also pays the banjo splendidly(I will be sneakily trying to catch a glimpse myself as YouTube videos will not quench my thirst for his eclectic rhythm). As well as this there will be other pieces of entertainment in the Victory Street Party, which hosts a variety of stalls, an Earl Grey Tea Shop (yum!) and 2 hilarious eateries/ watering holes named Dig For Victory (think salads and fruit smoothies) and the Spit n Sawdust pub! I will be there in my RAF corset doing meet and greets and posing for pictures, so please collar me as I walk by for a photo and chat! I hope to see many regular faces as well as new ones and remember to take the opportunity to dress up and join in the fun! Posted in Events and Performances, Publicity and Media Announcements and tagged 1940s pinup, car events, classic racing events, goodwood 2012, goodwood entertainment, goodwood events, goodwood racing, goodwood revival, kitten von mew, kitty von mew, vintage events, vintage girl, vintage pinup, vintage shopping, vintage stalls, ww2 pinup, wwii pinup. Bookmark the permalink. I have just received a photo CD from Lee and had to post up some of his shots from Twinwood 2012. There were so many great ones, it was hard to narrow them down, but they deserve to be seen! 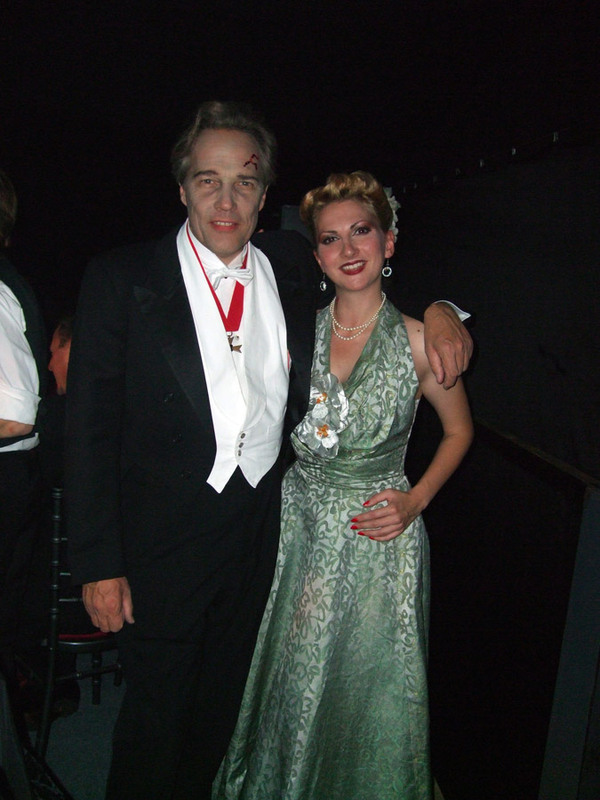 Here are some of my Lili Mewleen burlesque act from the Colonial Club and a few of my ATS fan dance at the Casablanca! 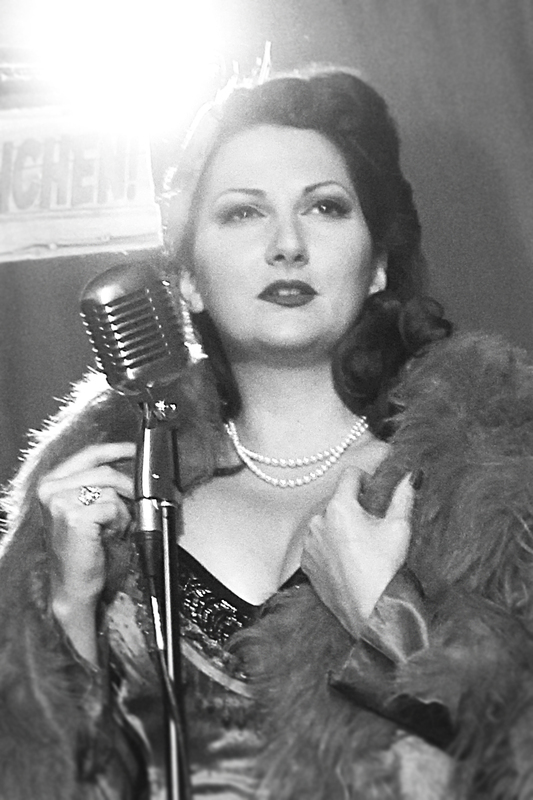 Posted in Events and Performances and tagged 1940's burlesque, 1940's fan dance, 1940's music events, burlesque, casablanca club, fan dance, kitten von mew, kitty von mew, music festivals, twinwood, twinwood 2012, twinwood festival, twinwood festival 2012, vintage burlesque, vintage fan dance. Bookmark the permalink.